Hi everyone! I'm reviewing one of my favourite facial soaps today - The Kanebo Freshel Clear Soap. I've been using this for about 2 and a half months now, and I really love it! My skin recently did a 180 on me and went from dry to completely oily-combination. That meant a product overhaul - changing skincare from heavy, super moisturizing to light, oil-free. 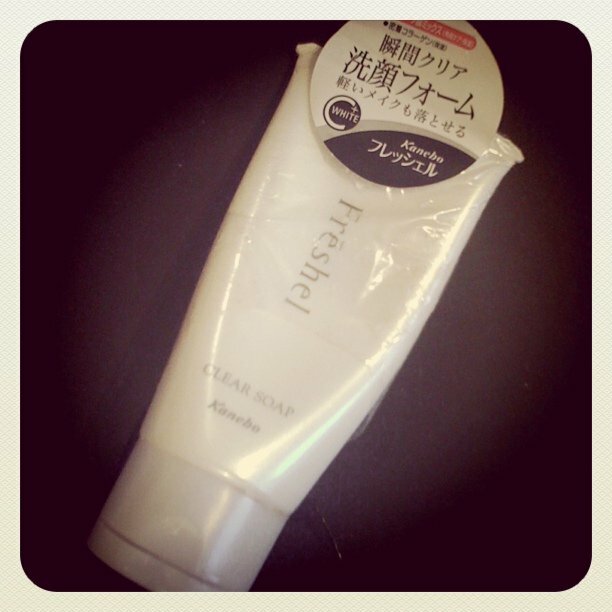 One of the products I picked up was this foaming cleanser. I loved it from the moment I started using it! Another foaming scrub in a squeeze tube. It's easy to dispense, and of course, I keep it out of the shower to avoid that cold water collecting in the cap. It looks pretty posh too, with pearlescent white packaging and minimalist design. The cleanser itself is thick and white, and obviously foams nicely. This product is infused with clay, so it smells a little funny, but the smell doesn't linger on your face, so it doesn't really bother me. A clay-infused foam cleanser is meant to draw the oil from the skin to prevent excess sebum and oil production throughout the day. I only use this once a day, in the mornings, because using it twice in a day would strip your face too much of the oils, and cause you to produce more. Also, I recommend using this together with a hydrating, oil-free moisturizer to provide the proper hydration that your skin needs. I think this cleanser works really well! I love that it keeps my skin less oily in the daytime. I usually need to do a little powdering by mid-afternoon when I'm out, but after using this for a while, I haven't had to do any powdering, which I love!